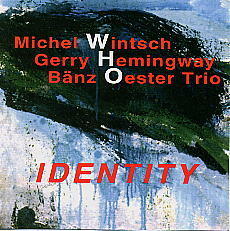 Michael Wintsch piano; Gerry Hemingway drums; Banz Oester bass (Schertler Audio Transducers and Velvet Strings). The CD is made up of thirteen compositions, the majority of which are written by Swiss-born Wintsch. His talent, both as composer and pianist blossoms within this format including two of his long-time collaborators, Hemingway and Oester.